I posted about eating at The Vietnam Woods in Wanchai a while back and have mixed feelings about the place (my first visit was amazing, the subsequent two were subpar). However, I had heard that the Vietnam Woods is the upscale sister restaurant of Lo Chiu Vietnamese Restaurant, long famed for its authentic vietnamese fare (I believe the restaurant has been operating for over 20 years!) One night while staying at Elements, me and dad decided to see what all the fuss was about - the restaurant is a mere 5-8 min walk away from the mall. I was shocked by how different the interiors of the two restaurants are. While the Vietnam Woods is done up all glam, with large spaces in between tables and a glorious high ceiling, Lo Chiu is like your typical cha chaan teng and really focuses on the local crowd. I guess I shouldn't have expected more given its location in a grungy part of Jordan. Wah loved the spring rolls. Wasn't sure if I was meant to eat it wrapped in the bahn hoi to the right of the picture, but figuring that would be far too much coordination for a very ungraceful eater like me, I just stuck to wrapping the spring rolls in the super fresh lettuce. SO GOOD. Dipped the bahn hoi, which taste very much like vermicelli, in the fish sauce and it was pretty delicious too. I love how light and fluffy it is! I think this is bahn cuon but my knowledge of Vietnamese food is rather limited :\ Basically just a rice roll filled with ground pork and other seasonings. 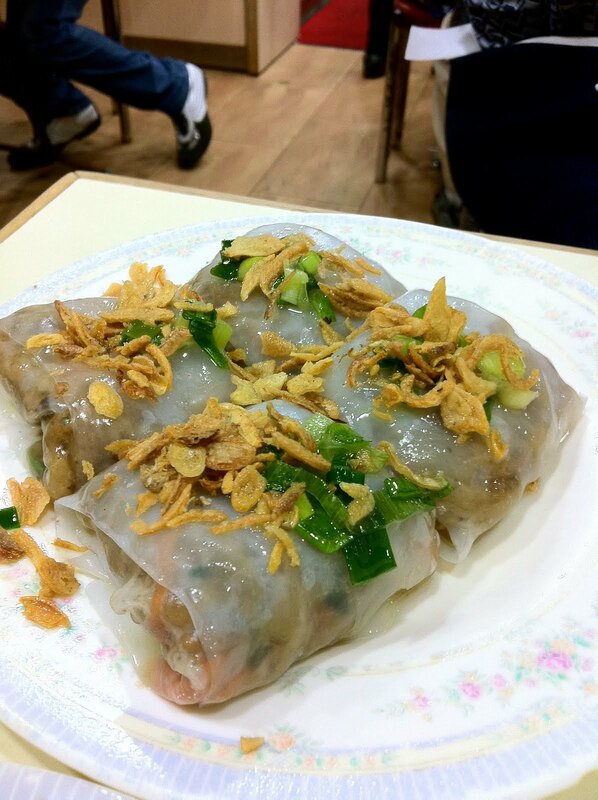 Really enjoyed the chewy rice sheet but could only manage one as it was packed quite densely! All in all, a very good value meal and much better than the Vietnam Woods in my opinion. Everything tasted authentic and fresh, and I would happily return to try their curries! Should probably come with a bigger crowd so you can try more dishes - though that said, the restaurant is pretty small and tightly packed. (Btw, if you want to get your bahn mi fix, Tim Kee is on the same street at #30 and they serve up pretty good bahn mi's that are probably on par with delicieux bistro on Graham Street at a fraction of the price).